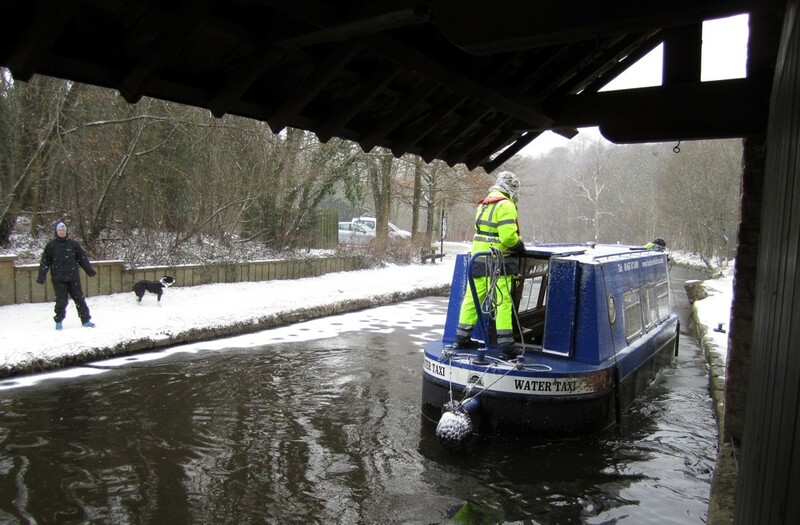 With the main cruising season over for another year, winter stoppages have now started in earnest on the waterways network. All the ones programmed for the Huddersfield Narrow and Broad start after Christmas. You can download a relevant extract from CRT’s published notices below, giving details of the work being undertaken and the nearest winding holes. 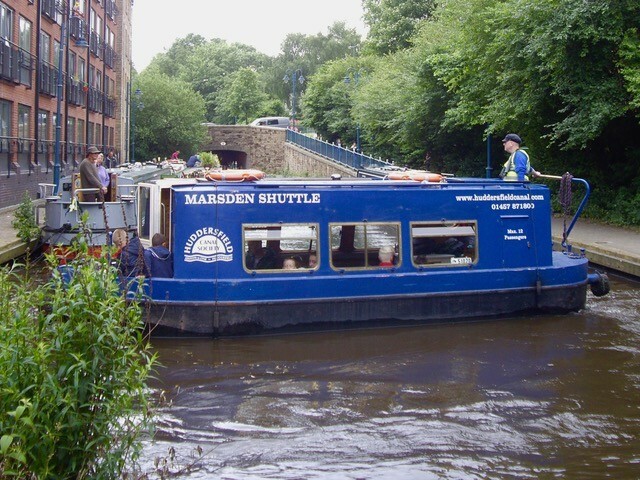 Our Marsden Shuttle heading off from Wool Road to Portland Basin on a chilly 2013! Two restrictions to navigation are currently in force in the Colne Valley on the ‘East Side’ of the Huddersfield Narrow Canal. 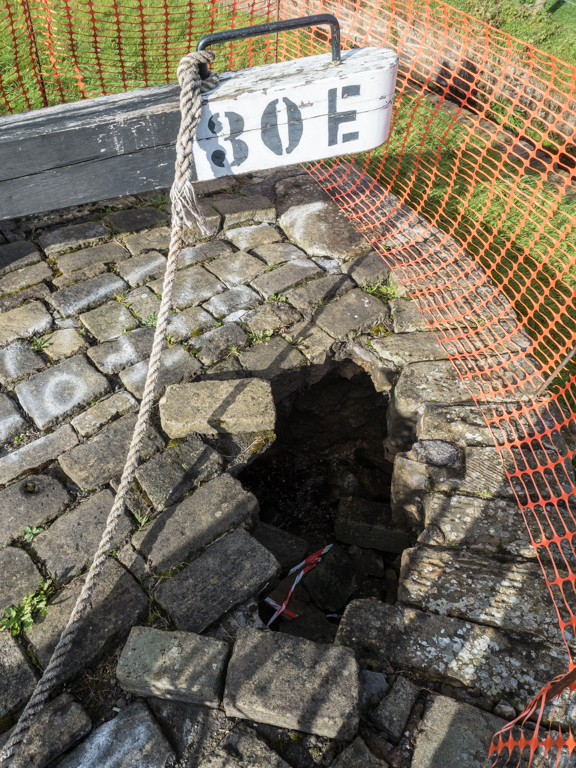 A hole has appeared in the stonework behind the off-side down stream lock chamber at Lock 30e. As a safety precaution until a repair can be made, the Canal & River Trust are asking boaters to give 24 hours notice of intended passage so that a member of staff can help them through. The first picture shows the gaping hole at Lock 30e, with water flowing through it. The second shows Terry Sigsworth preparing to open the gate with a rope to overcome the missing stonework. Lock 22e leaks into the basement of the adjoining mill. 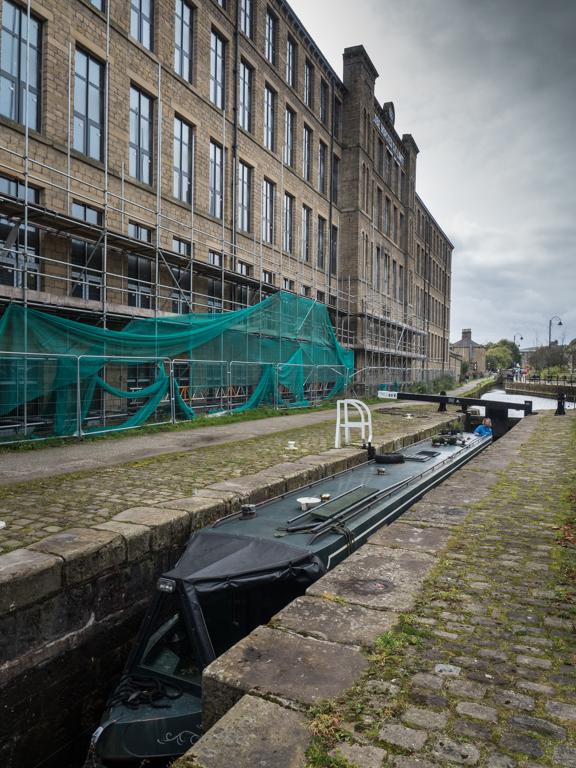 The third image shows that refurbishment of the 1887 mill in the centre of Slaithwaite is well underway and it is not surprising that the leakage has become a major hindrance to the contractors. The canal will be closed at this point from 9th to 22nd October 2017 to enable the lock wall to be sealed by pressure grouting. 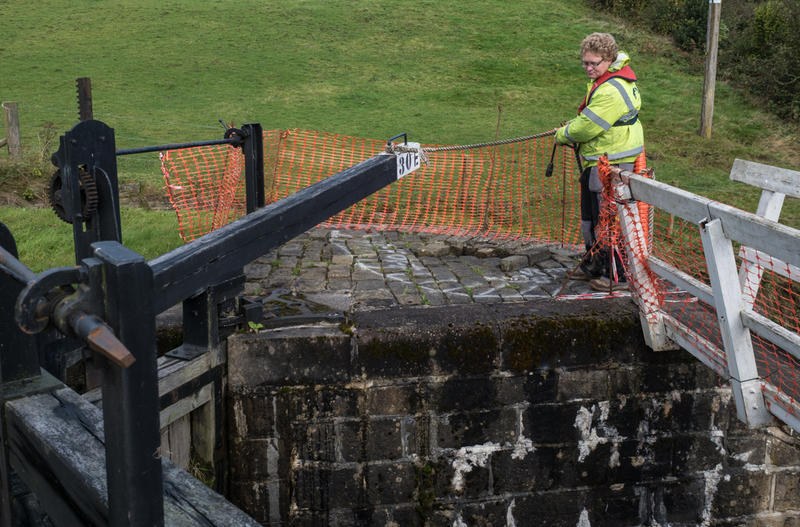 In the meantime a staff member or volunteers from the Canal & River Trust is assisting passage and ensuring that the lock is left empty after each use. 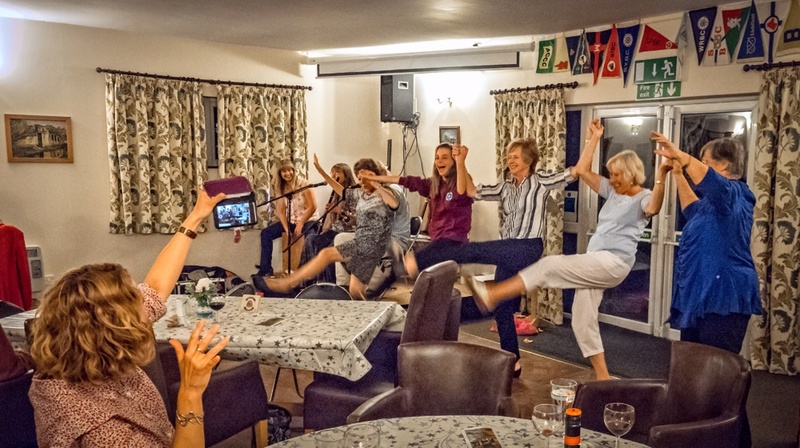 South Pennine Boat Club (SPBC) and Calder Navigation Society (CNS) hosted a rousing last night of the Explorer cruise in the excellent club facilities at Battyeford. Even the sun came out as CNS lock-wheelers helped 9 boats down the Huddersfield Broad into the Calder & Hebble. Christine and Chris brought their 59 foot long narrowboat Ketura through the 1776-built locks without a hitch. The 150-year old Locomotive Bridge was hosted and dropped 9 times as the convoy left Huddersfield. By early afternoon all the boats were found moorings in the well-appointed marina taking the places of boats which were cruising elsewhere on the network. SPBC catering team supplied tea and scones as crews relaxed in the pleasant surroundings. By 7pm around 70 had gathered for the final evening. 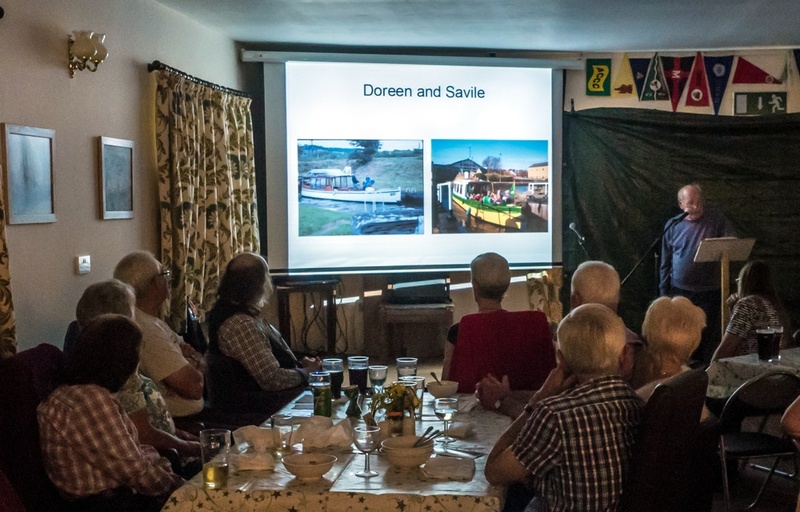 Guest boaters and some of the Huddersfield Canal Society helpers joined SPBC and CNS members for an evening to remember. The three crews whose boats exceeded the dimensions of the Broad all made their way by car or bus to join in the fun. CNS provided a complimentary pie and pea supper and a fine range of desserts courtesy of Avril Davies and her team. SPBC operated their splendid new bar. The real ale, wine and soft drinks flowed. Peter Davies welcomed guests and club members resplendent in shirt jacket and tie, almost unrecognisable from the waterproofed biking lock-wheeler of Wednesday. 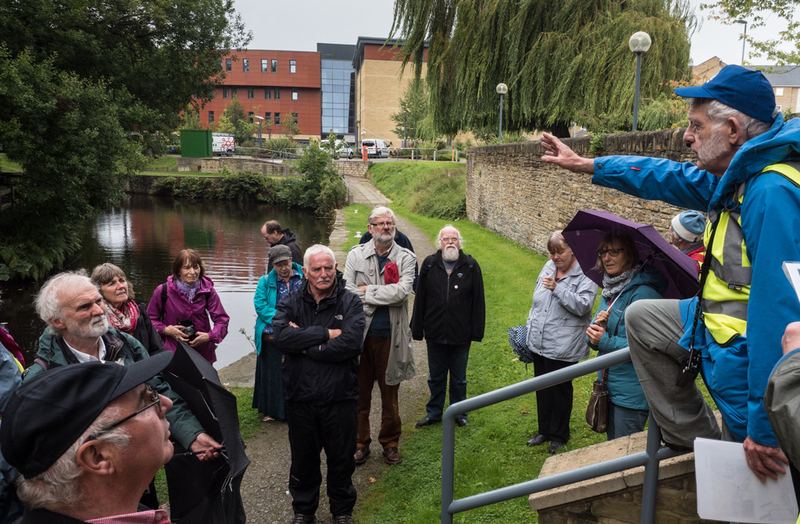 Richard Stead gave and informative potted history of the Calder & Hebble navigation including images of the 2015 flood damage and an insight into the unique C&H hand-spike. The raffle helped defray some of the costs and the prizes were happily shared between hosts and guests. Frank Auffret warmed up the audience with a ditty or two ably assisted by the SPBC male voice choir and the excellent Kirkpatrick trio provided live music to listen and dance to. It was an opportunity to thank all who have been involved in the cruise – the boaters for coming, the canal society (HCS and CNS) and boat club (Tudor Cruising and South Pennine) volunteers for helping with the passage and final night mooring respectively, all those organising and hosting evening events, Canal & River Trust staff and volunteers for ensuring that no challenge was left unresolved. Was the cruise a success? By common consent it was. Hard at times when the weather was at its worst but all will take home happy memories of their Pennine transit. Some will retrace their steps (or should I say Locks) in the coming days. Most will carry on their adventure via the Rochdale, Leeds & Liverpool or River Trent. We wish them safe and enjoyable cruising. Will it ever be repeated? Who knows? It has certainly demonstrated the resilience of the Huddersfield Narrow Canal. When was the last time 12 boats made the same passage on the same day in the same direction? If it has ever been done before it will be in the early 19th century. It is doubtful whether 12 boats have ever started from the same pound and moored in the same pound. It required careful water management each evening and morning particularly at Milnsbridge. Pat Stow of Diligent Too summed it up: ‘It’s been a fantastic experience’. 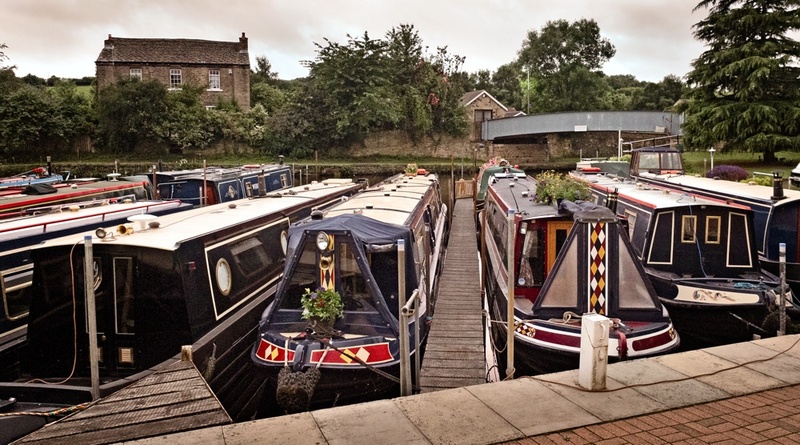 Pennine Explorer narrowboats mingle with club members’ boats at Battyeford. Assembled guests and hosts listen to Richard Stead’s presentation. and we’ll add the best for everyone to enjoy! 8 locks down to Huddersfield sounds easy but it needed careful water management because 12 boats don’t normally do it in quick succession. 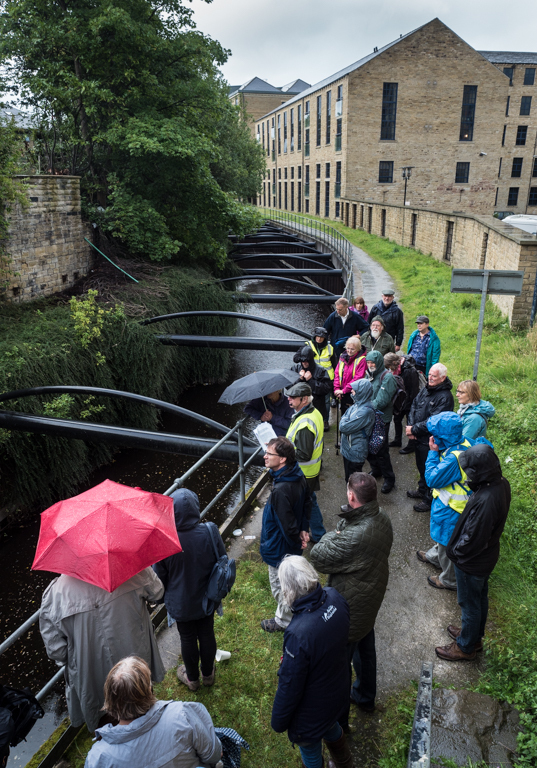 Excellent support from Canal and River Trust staff (Will and Colin) supported by Canal Society volunteers (Dave and Diane, Paul and Keith) at the locks meant that all 12 boats arrived at the Huddersfield University moorings by 2.30pm. 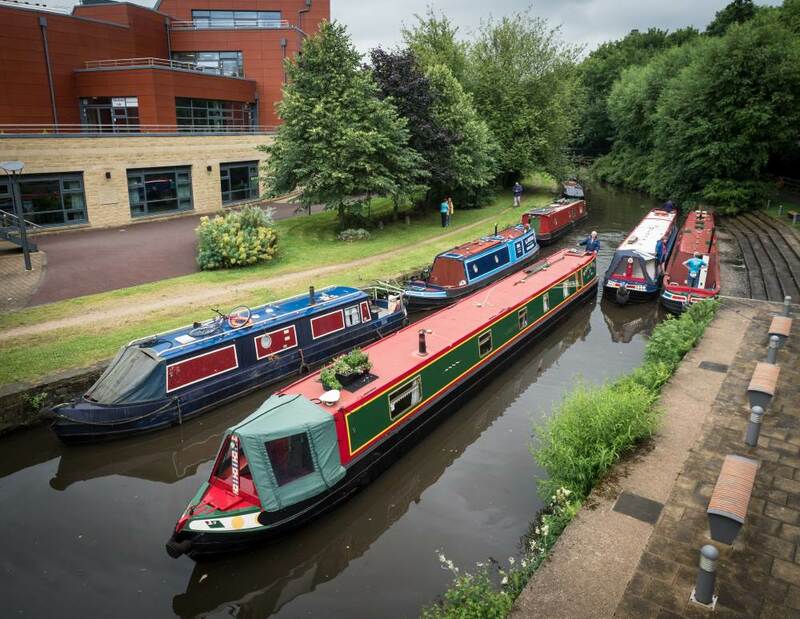 The University site full of boats was reminiscent of the rallies which the Canal Society held around 20 years ago to raise awareness of the restoration potential. In the evening we assembled in Heritage Quay – the splendid new University Archive centre – to award the plaques to all the boaters who had crossed the Pennines. Jack Kershaw on behalf of the boaters thanked all involved for the organisation of the cruise and signalled out particularly people for a special mention. They know who they are. 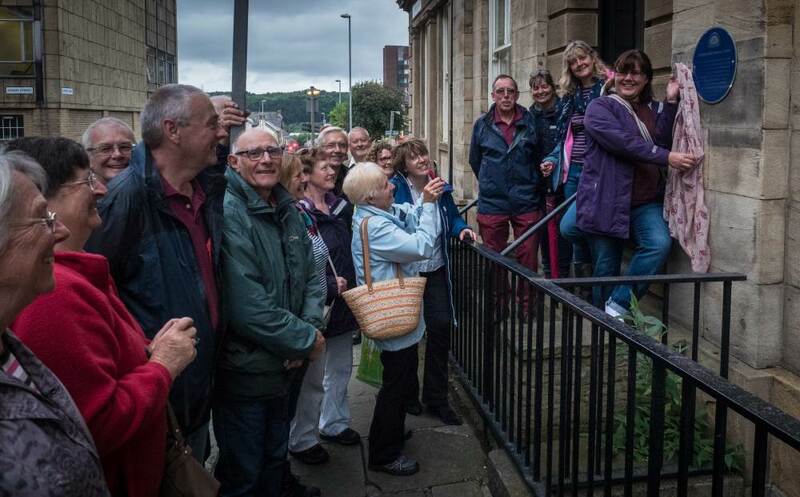 Afterwards Alan Stopher, Chair of the Society conducted a walk around Huddersfield Town Centre to show our visitors fine buildings, sites of historic significance and what makes Huddersfield the town it is. We paused to read the plaque on the façade of the original George Hotel where the Huddersfield Canal Company had been formed in 1793. The building had been sited at the Market Place but the Georgian façade had been taken down and reconstructed in St Peters Street to make way for the new thoroughfare of John William Street and New Street. After taking in St George’s Square, surely the finest urban square in the north of England, we retired to the Sportsman pub to slake our thirst. The cruise through the Huddersfield Narrow’s 74 locks is over but with many happy memories. 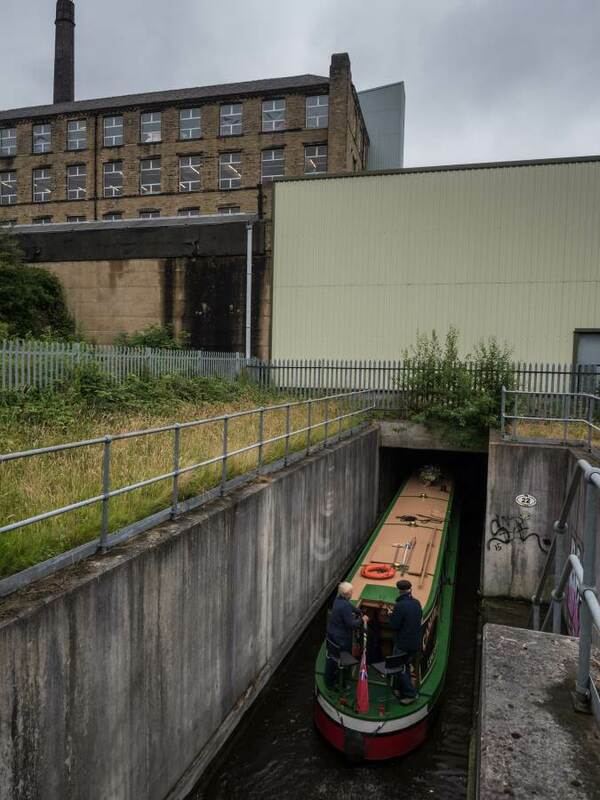 Tomorrow (Saturday), 9 boats head down the Huddersfield Broad to Battyeford …….